SALT LAKE CITY, UT, Apr. 2, 2015 – The Maze is to mountain bikers what Mount Everest is to mountain climbers. Once challenged and conquered it represents the epitome of personal accomplishment. 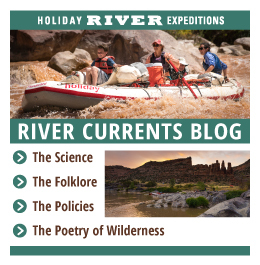 For over 45 years Holiday River Expeditions (https://www.bikeraft.com/) has been outfitting and leading oar-powered excursions by raft on the wildest rivers of the West. They helped introduce guided mountain biking in Utah and Colorado nearly 25 years ago. Veterans of the backcountry, they consider the Maze District of Canyonlands National Park their ultimate ride, best suited for only the most intrepid fat tire fanatic. In spring and fall Holiday offers four-day, three-night mountain bike explorations of the Maze in small groups of no more than seven guests and two guides. Daily itineraries can vary widely from one trip to the next based on group desires, abilities, trail conditions and Mother Nature. Groups meet at the Holiday River Expeditions headquarters in Green River, Utah, and board a shuttle for a three-hour ride to Bagpipe Butte Overlook where the fat tire fun begins. The first day’s ride follows the Flint Trail, the most technically difficult riding of the trip. Those with less experience feel no shame in walking a short stretch of this mile-long descent into the country the old-timers call “under the Ledge”. The trail takes a more serious descent off the Flint Cove onto the White Rim Sandstone layer, where it will be wide open riding to the Maze Overlook and camp for the night. Participants bike 20 miles this day and lose about 1700 feet of elevation. On Day Two guests descend by foot into the labyrinths called the Maze. A half day walk through time leads to prehistoric Indian panel called The Harvest Scene, a message left a thousand years ago by the Ancestral Pueblo or Ancient Ones. Visitors then exit the Maze in the Land of Standing Rocks where bikes are waiting for the afternoon ride to camp. Lizard Rock, Chimney Rock, the Wall, the Plug and The Fins are a few of the countless rock monuments that make Day Three’s ride border on surreal. Depending on group desires, this day’s riding will cover between 10 and 30 miles with plenty of viewpoints to stop and garner inspiration. On Day Four Mother Nature serves up wide-open riding down gradual slopes and through occasional dips into desert washes. Shortly after lunch the road emerges at Lake Powell and Hite Marina. A passenger van meets the group for a two-hour ride back to Green River, Utah. While this option is best for experienced and advanced riders, Holiday also offers other mountain bike adventures more suitable for beginners and intermediate enthusiasts. The 3-day White Rim Trail ride that explores Canyonlands’ Island in the Sky runs $730 with trips scheduled for May 2-4, Sept 5-7 and 19-21, 2015. 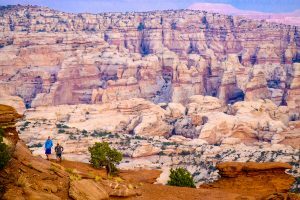 Holiday’s 3-day San Rafael Swell Tour explores a rarely-visited region of Utah where dinosaurs, Native Americans and Butch Cassidy once roamed. Trips are $730 per person and run Sept 16-18, 2015 or scheduled privately upon request. Other tours that take in the La Sal Mountains and Dinosaur National Monument’s Yampa Bench are offered as pre-set dates or privately scheduled departures. Holiday River Expeditions (https://www.bikeraft.com/) began in 1966, when Dee Holladay and his wife Sue took the plunge to become river outfitters. Due to its respect for the lands, rivers, guests and employees, the family-owned-and-operated company has grown exponentially. Each of its guides is professionally trained in first aid and river safety, and with over 48 years of experience, the company provides guests the opportunity to explore the nation’s wild lands safely and securely. Holiday River Expeditions has a philosophy to protect the environment through education and conservation, and as such, uses oar-powered and paddle rafts exclusively.